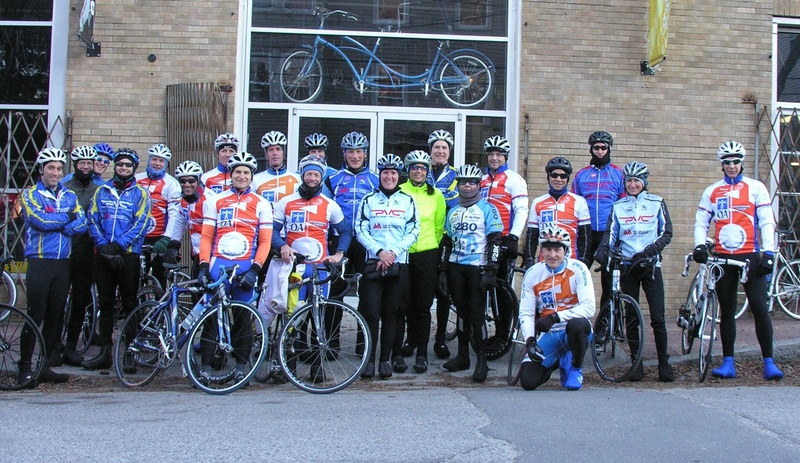 After posting this photo before heading out on a very chilly Saturday morning ride with the club, my friend called it “March Madness”. We have seen below normal temps for over a week now. It feels like it will never warm up. At least this morning it wasn’t snowing like it was last Saturday morning. The alternative to riding outside this morning was the trainer (yuck!) or waiting for it to “warm up” but having to deal with 20+ mile an hour winds. 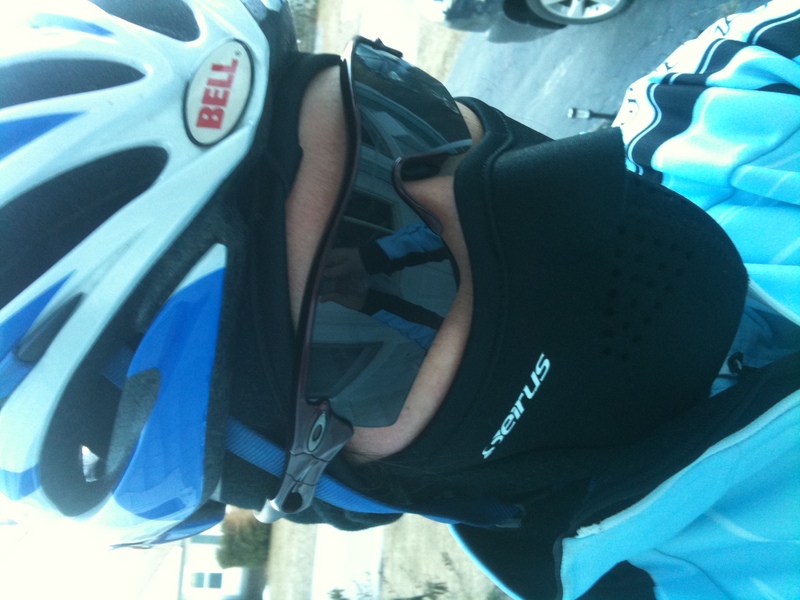 So a cold morning ride seemed like the best option for me. What Does Getting Dropped Sound Like? My goal was to go out tonight and ride a decent effort. I knew right away that my legs had nothing to give. And why should I expect anything different? They gave me a lot yesterday in the time trial. It probably didn’t help that I didn’t have much for lunch today. My first day back at work after my vacation and although it wasn’t too crazy, it was a bit hectic during the lunch hours so I only ate a Cliff Bar for lunch. I showed up at the ride after a 20-minute warm up. We started out on time and I promptly was dropped on the first climb. A nice OA/Cyclemania guy dropped back to pull me along the flat section before the turn onto Range Road, which can be a challenging road, especially with a head wind. I knew then I was done. I told him that I was peeling off the ride and not to wait for me. So I just rode tempo all the way home. My legs felt okay when I stood up but when I sat back in the saddle they were just jello and would barely move. I think I’ll spin them a little easy tomorrow and make the most out of Wednesday’s ride and also try to ride the Thursday night ride this week. My friend and bike club member, Tracey, set her sights on making a Christmas Cheer ride this year. She had the thought last year but it never materialized. This year she set her sites on it and made it happen by rounding up participants, purchasing antlers and a Santa suit, and decorating a kiddie cart/tag along for a sleigh, complete with wrapped packages. The ride started by going around Baxter Boulevard with a stop at a nursing home. 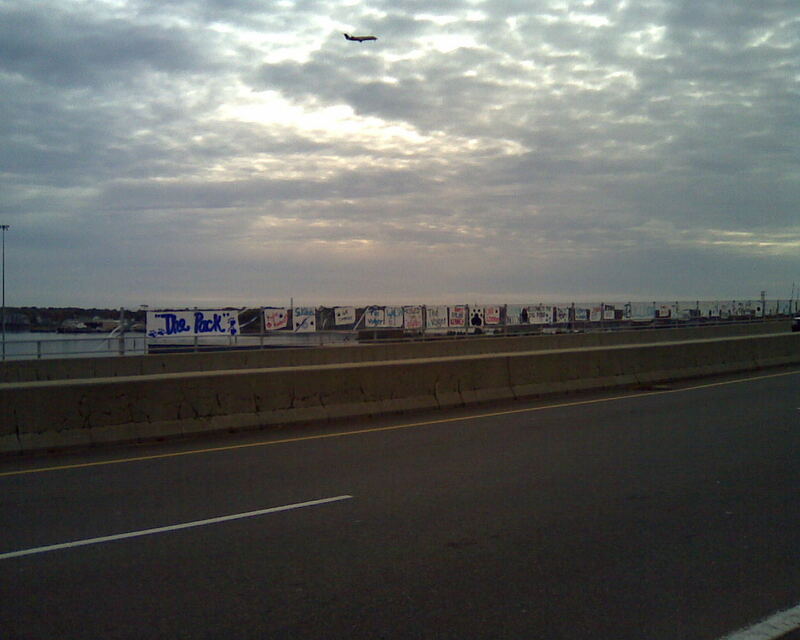 Then it we dashed away to the Old Port to spread some holiday cheer. We were greeted with honks, waves and smiles. Some even took pictures! It was a great day for it with temps in the low 30’s, sunny and no wind. We all had a terrific time wishing Merry Christmas to the shoppers in town. Hopefully it will become an annual event! I planned a casual ride with a couple friends for later in the day Saturday so I could go to the Farmer’s Market with my husband first thing in the morning. We’ve been away a fair bit on the weekends, not to mention my husband’s work has their own farmer’s market every week and the prices are much better than any other around, so we haven’t attended the Saturday one in Deering Oaks Park since late spring. We were in search of non-paturized apple cider. Most places will only sell the paturized type and we know we can buy this item at the market. We were successful in our quest and bought 3 gallons! 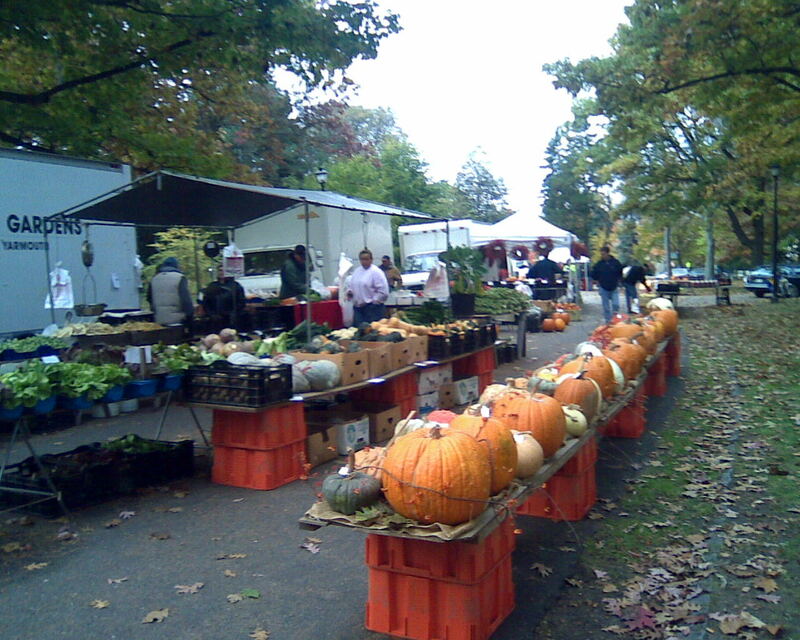 I always love going to the market in the park on Saturdays. It’s great to walk around to see all the wonderful products grown and sold locally. Then it was home in time to head out for the ride. It was overcast but surprisingly warm. I am so used to 50-degrees being somewhat chilly but that was not the case Saturday. It was actually mild and I found myself very over dressed. From here it was off to Scratch Baking Company for coffee and a little snack. I always buy a coffee for me and a lemon pound cake for my husband. I can manage to fit it into my jersey pocket without crushing it. After some pretty heavy rain and wind Saturday night the sun poked through late morning Sunday. I was rather surprised. I thought it was going to rain most of the day and had prepared myself for some much needed cleaning and cooking. I wanted to take advantage of such a spectacular day with a bike ride. I know we wouldn’t see many more days like this until spring. In fact the day reminded me a bit of spring and I was feeling a renewed sense of life, something I haven’t felt much of lately. As it turns out there were a few people that were getting together for a ride. It was noon when I found out about it and they weren’t leaving until 2pm. That was enough notice to get a little cleaning done before heading out so I wouldn’t feel so guilty. 8 is not a bad turnout for an impromptu Sunday afternoon ride! With temperatures in the mid-60’s it was nice to be in shorts and short sleeves. It’s now late enough in the season that the mid-week group rides have come to an end. It’s just too dark too early. So there will be more weekend rides throughout the fall. I’m looking forward to them. 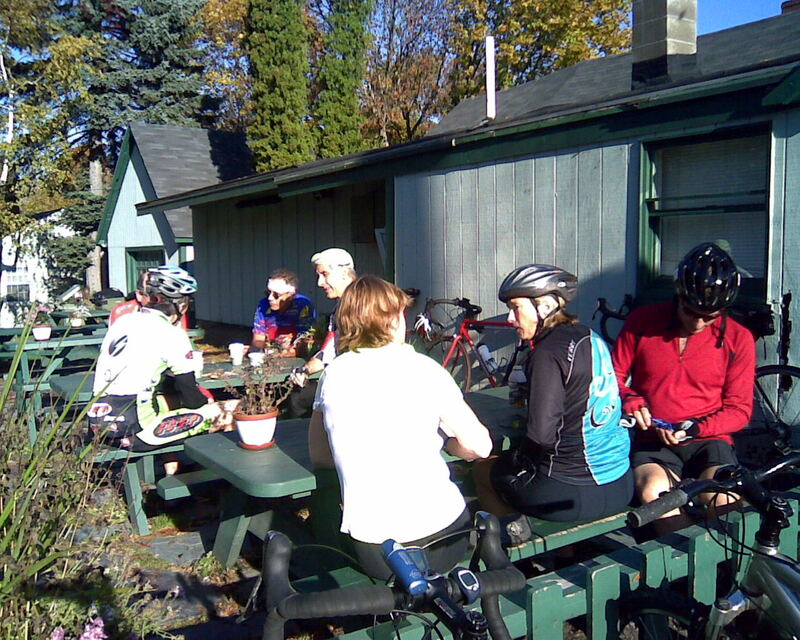 They typically consist of a good group of cyclists and involve a stop someplace for coffee. It’s a great social event.